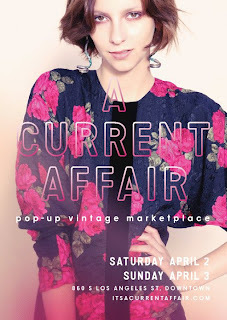 If you’re looking for something fun to do this weekend be sure to stop by the penthouse in the Cooper Design Space to browse through the wares of over 25 vintage retailers and private dealers participating in A Current Affair's pop up vintage marketplace . There will also be an exhibition of 10 vintage looks curated by Emmy Award winning costume designer and author of “Color Your Style,” David Zyla. 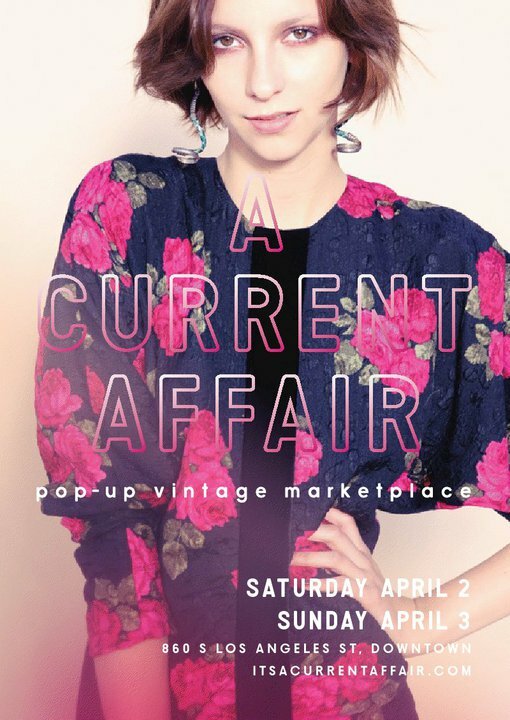 Attendees on Saturday can enjoy complimentary drinks while shopping, courtesy of Pama Pomegranate Liqueur, Izze Sparkling Juice, and Smartwater. Tunes will be provided by DJ William Lemon III. The event will take place Saturday April 2nd from 6 p.m. – 10 p.m. and Sunday April 3rd from 11 a.m. – 5 p.m. Admission is $10. 860 So. Los Angeles St.
Nice post appriciated work , I found here latest current affairs on this blog.